The fungi (singular fungus) or mushrooms are multicellular living beings who are an important part of the flora. 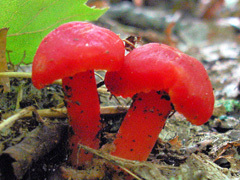 Is known in Quebec over 3000 species of fungi but there is probably 3 to 5 times more. If the fungi are, in number of species, the most important contribution to a given flora, they are relegated to second place by their more discreet visibility than plants. They have long been classified with plants though in fact they are closer to the animal kingdom that plant. Indeed they have a chitinous cell wall similar to that of insects, and must, to meet their energy needs, absorb food, just like animals, while plants gets their energy from photosynthesis. The fungi reproduce by spores, what we see in nature, what we call mushrooms are actually fungi spore devices, which is why they are often referred to as sporocarps. The fungus itself is much broader and largely hidden in the ground or in a substrate such as wood from a tree. In fact, the largest known living thing on the planet is a fungus, it is an Armillaria ostoyae, aged of 2400 years (maybe three times more) and measures 880 acres (9 km ²). The fungi are so many and diverse they deserve a site to them alone, so my site will not treat of mushrooms. Perhaps one day I will make a site for them, meanwhile numerous sites dealing with mycology (study of fungi) and describe a number of species of fungi most frequently encountered. Nomenclature Rules for latin, french and english plants names.